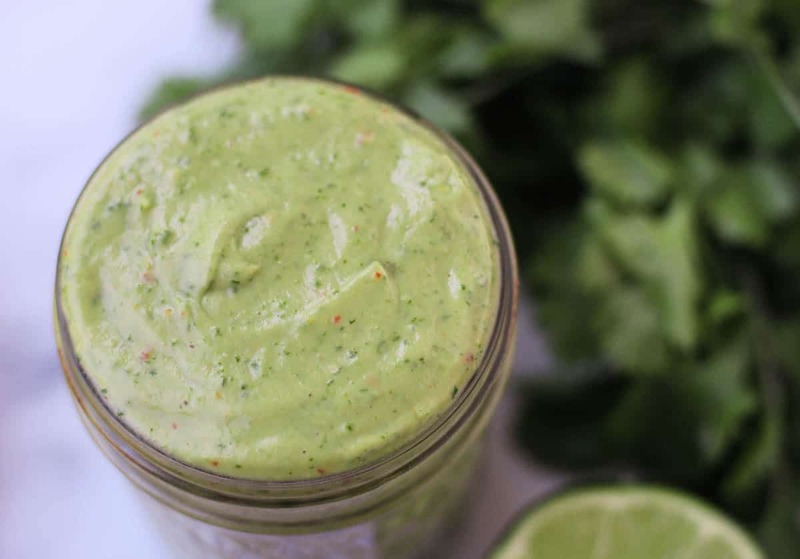 A super simple avocado sauce you can throw on just about anything, this Spicy Avocado Lime Sauce comes together in less than a minute and is paleo, Whole30, and vegan! If you have followed ETG for some time, you know my food revolves around sauces. 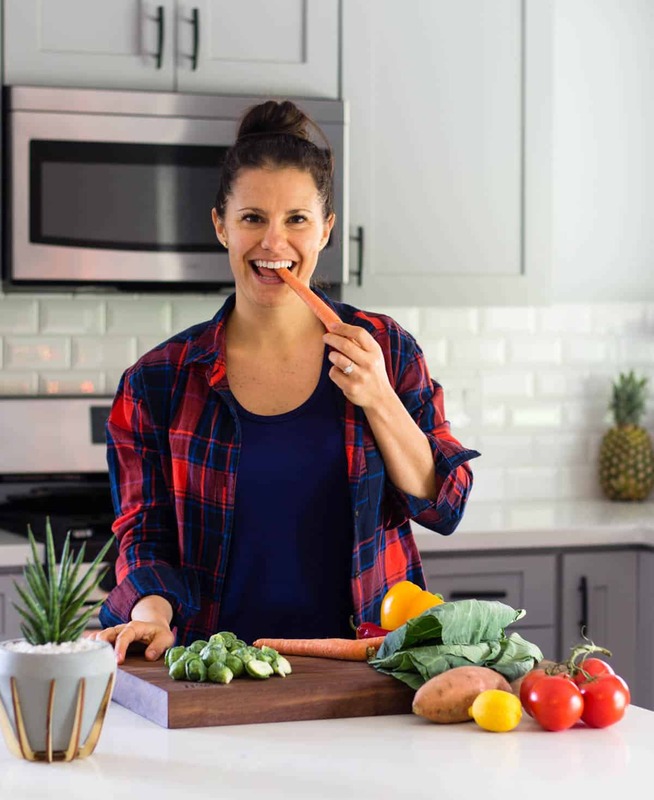 Whether it be with carrot fries, on meatballs, or just an easy dressing – I love sauces. Meat and veggies are good, but can get a little old after awhile. I am always making sauces to pair with them so I never get bored! What I make usually changes on a daily basis depending on what I have on hand, but I figured I would share one that can go with just about anything. And what else goes with everything other than avocado. 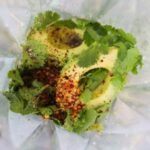 From breakfast all the way to dessert, avocados are so versatile. 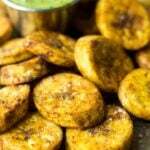 They are also loaded with healthy fats that help lower cholesterol and reduce the risk of cancer and diabetes. Along with those healthy fats comes fiber, folate, vitamin A, and beta-carotene! 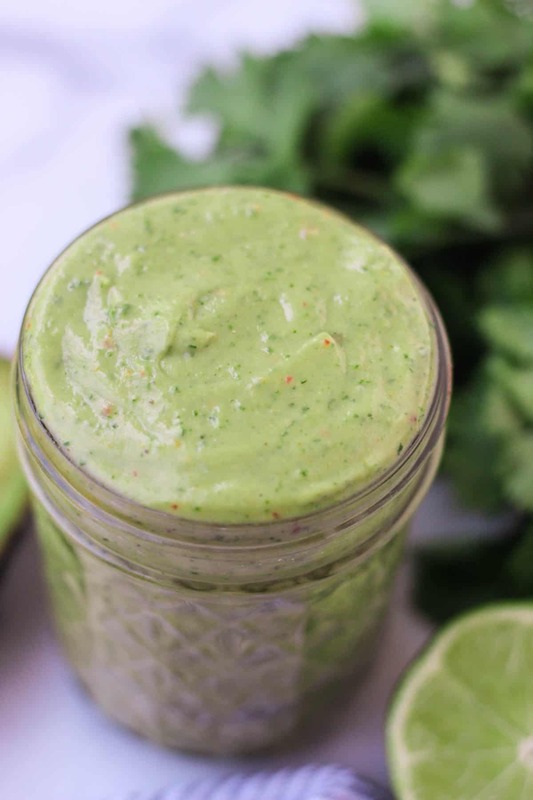 I blended the avos up with some of my favorites ingredients to make this creamy sauce. The other players in the game are cilantro, coconut milk (for extra creaminess), lime juice, red pepper flakes, salt and pepper, and a little water. If you are one of those people that don’t like cilantro, you could leave it out or substitute parsley. 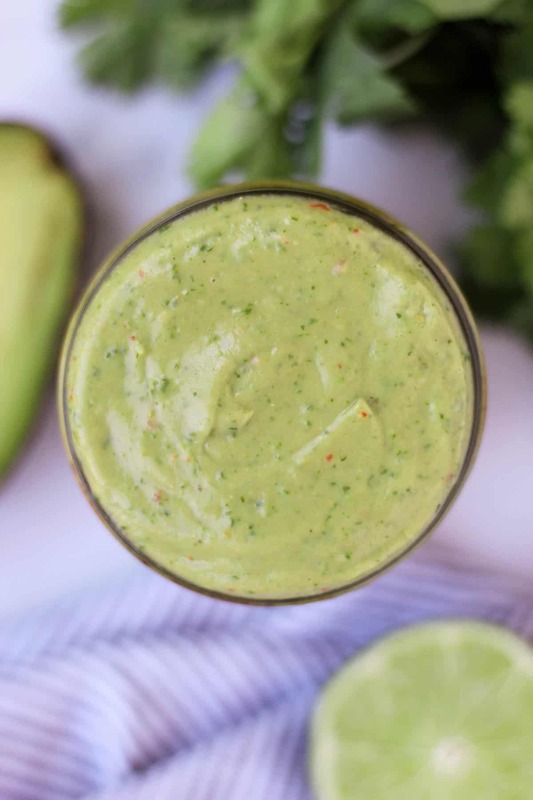 With Cinco de Mayo just around the corner, this spicy avocado sauce can go with just about anything you plan on eating! Whether it be fish tacos, stuffed peppers, or just with chips and salsa. I’ve been adding it to my eggs in the morning, in my collard wraps, and on whatever else I am eating. If you have ever saved an avocado before, you know they get brown. While this sauce does turn a little brown after a few days, it still tastes great. 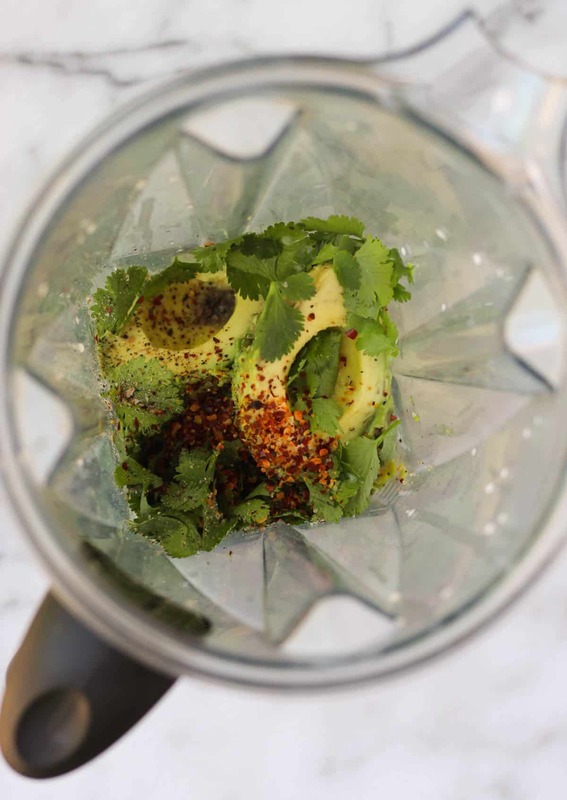 Place all ingredients into a Vitamix or high powered blender. Blend until smooth and creamy, about 30 seconds. 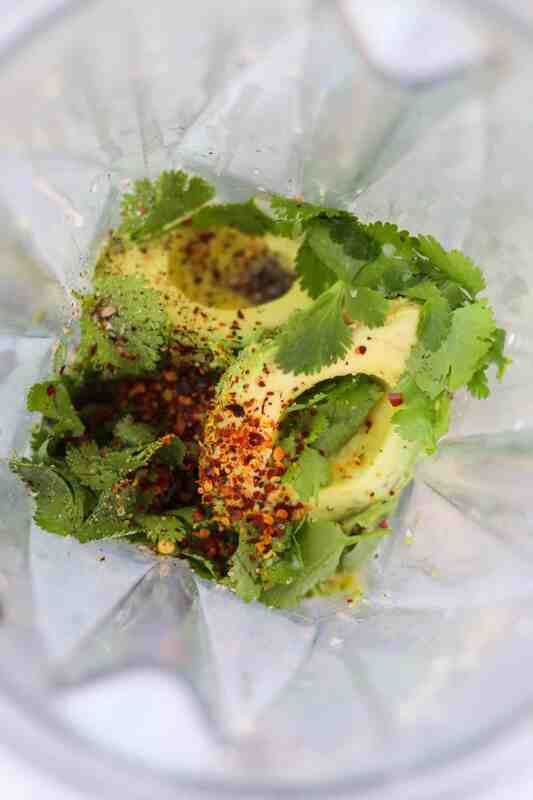 Pour all over your favorite foods! This post contains affiliate links and I may make little bit of money if you click on and purchase the products that are linked. It doesn’t cost you any extra money. The compensation helps with expenses to keep ETG up and running. I truly appreciate your support! I LOVE those sauces that you can put on almost everything; it looks so creamy. I might add less spice, because i have a very wimpy mouth, but the texture and flavor sounds so good. Me too! I am all about a good sauce! You can def hold off on the spice some, I just add spice to everything since I love spicy haha! this sauce sounds amazing Kelly! i am so excited that i can eat it while doing the whole30!!!!! how ling will it keep in the fridge? Aw yay, so glad to hear that Mary! I find that once sauces sit for a little, the flavors are really enhanced! 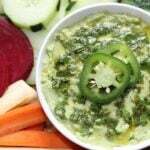 I made this sauce for the first time and i am not sure what i was waiting for… its amazing!!! I have since been putting it on everything I eat! Eggs, veggies, hamburgers, chicken, absolutely everything! Love , love, love!!! OMG yay!! It’s so versatile! Thanks for trying Diana, glad you liked it! Hi! Hubby’s allergic to coconut. Any suggested alternatives for coconut milk? I’m super excited to try this recipe. Hey Ros! The coconut milk adds a good creaminess to it, but I am thinking you can use any kind of milk (almond, cashew…), but maybe just use a little less of it since those aren’t as thick. I would start with 1/4 cup and add from there. Hope that helps!